A perfectly round rainbow-like halo surrounded the sun in several Mexican cities, including the country's capital on Thursday. People spent the day with their heads looking up at the sky, trying to capture the phenomenon and share it on social media. 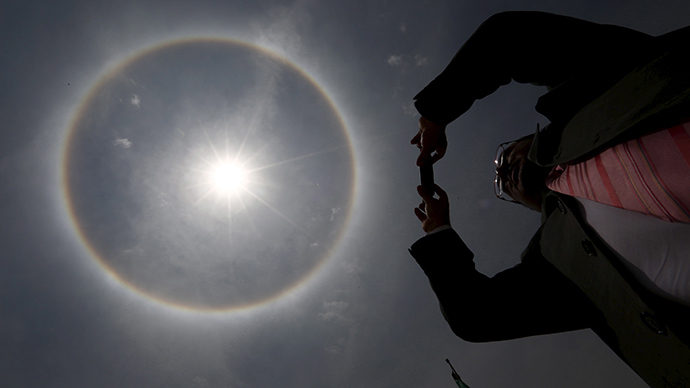 The ring around the sun could be seen in three Mexican cities, including the capital, Mexico City, local media reported. While the weather phenomenon is fairly common, people in the streets grabbed their cameras and smart phones to get a perfect shot of the optical illusion. "It's very common. The thing is that people never look up," the coordinator of the National Weather Service, Juan Manuel Caballero, told AFP. He added that he had received dozens of phone calls from scared people, who thought the phenomenon was "a bad omen." The perfect circular rainbow around the sun is actually formed by millions of tiny icy crystals in the upper atmosphere. The ice causes refraction, or the splitting of light, and the reflection of the light from the ice creates the optical illusion of the halo.